So it’s been only a few months now since BMX legend Martti Kuoppa decided to resign from the world of BMXing. According to him, he’s come to the end of the long exciting career that saw him pioneering many flatlander moves and having a genuinely successful career in a tough industry. Kuoppa said it took sweat, blood and tears before he realized he couldn’t better what he’s been doing in the last two years. His final decision was therefore to quit doing the sport professionally and focus on the business side going forward. 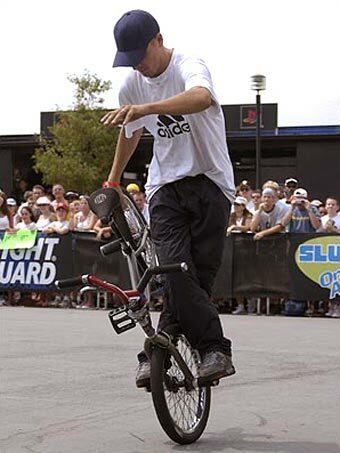 As we lose Martti as a flatland rider, we can still look back fondly. It’s not every day a BMXer starts out being sponsored by Chiquita Bananas after all. However, he would first taste real glory when he took the bronze in the 1998 X Games, the biggest extreme sports event in the world. Only three years later he would win the gold in the same event. After establishing himself in the sport, Kuoppa joined his friend Vicki in the KGB Bike Company enterprise. Together they not only created existing flatland bike products but also created some of their own. This kind of attention to detail and innovation could only be found in a true professional, who put everything he had into creating quality flatland accessories and parts such as frames and specifically designed bikes to give more room for tricks. With the demands of and up-and-coming brand clashes with a promising sporting career, Kuoppa was forced to leave the label in October 2006. However, after only a short time, he had started up his own brand, dubbed Jungle Rider, which would be a platform for him to create the Ground Tactics series. At the same time, he maintained an impressive biking career which kept awe-inspired fans excited on a global scale. A certified adrenaline junkie and type A personality, he was never able to sit still for long and was always eager to get out there and try new tricks. These were often broadcast on YouTube and kept him motivated to reach even greater heights. Kuoppa would eagerly await any opportunity to get out there and go bigger or develop already-impressive whiplashes and technical tricks. While he has hinted at the fact that he could return to the sport in future, we can only get our hopes up and hope that he does with no confirmation thus far. Fans the world over will be sad to see this legendary rider go. His innovation and hard work have inspired us here at Extreme Sports X as well. It’s safe to say that like so few, Martti Kuoppa has really left a legacy in the BMXing community where we can only hope that some of the young and most talented riders now have room to step up and fill the spot. Of course, Martti’s unique style and boundless bravery are the characteristics that he’ll be remembered for in the industry. We look forward to seeing what he does in 2012 and beyond. This entry was posted in BMX, Land Sports and tagged BMX Legend, Martti Kuoppa. Bookmark the permalink.